Team captain Paddy Curran led by example as Kerry qualified for next month's ESB All-Ireland minor football final, beating Donegal 2-13 to 1-10 at Croke Park today. The Waterville forward, in his third year at the grade, scored 1-06 (0-03f) as the Kingdom kept in the hunt for their first minor title since 1994. They will face either Roscommon or Meath, who clash next Sunday, in the final on September 17. Donegal, with Dara Gallagher bagging two points, led 0-06 to 0-03 just after the midpoint of the first half this afternoon. Crucially, wing forward Dualtach Molloy, one of the heroes in last month's Ulster final, missed a goal chance and Kerry bounced back before the break. They hit four successive scores – Curran, midfielders Garry O'Driscoll and Tommy Walsh and tireless wing forward David Moran were all on target – to climb back in front. Kerry lost corner-back Brian Russell to a shoulder injury at the break but they easily built on their 0-07 to 0-06 interval lead with Curran (free), Eoin Kennedy and Moran wrapping over three points to a single effort from Martin McElhinney. Donegal wing-back Paul McGinley did get forward to cut the gap to two points – 0-10 to 0-08 – but substitute Jamie Doolan, teed up by Aidan Greaney and Eoin Kennedy, netted in the 44th-minute to strengthen Kerry’s grip on the game. Mike Murphy and Gallagher, slotting over his third, made it 1-11 to 0-10 but that was as close as the Tir Chonaill youngsters got. The classy Curran then hit 1-01 in the space of ninety seconds, with his 53rd-minute goal a planted finish past Lee McFadden, to confirm Kerry's progression to the decider. McElhinney stabbed home a consolation goal, three minutes later, after a mistake by Mike Moloney and excellent double save by Kerry 'keeper Tomas Mac an tSaoir. Kerry manager John Kennedy said afterwards: 'It was a brilliant second half from our guys – we’re absolutely thrilled to have made the final. 'I'm delighted for the players, they worked extremely hard after quite a poor first half and made it a great day for minor football in Kerry. 'I think they were a bit nervous (in the first half) with it being our first time at Croke Park, but we pulled through and can look forward to seeing what the two other teams have to offer in the other semi-final,' added the Asdee clubman. 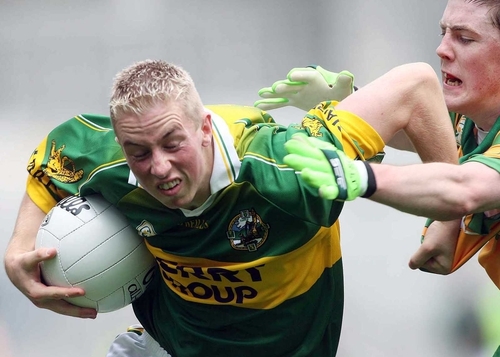 KERRY – T Mac an tSaoir; B Russell, M Moloney, D O Se; S Enright, A Greaney, B Costello; T Walsh, G O’Driscoll; P Curtin, D O’Shea, D Moran; G Sayers, P Curran (capt), E Kennedy. DONEGAL – L McFadden; D Walsh, S Boyle, M McGowan; P McGinley, P Thornton, L McLoone; R Wherity, M Murphy; E Waide (capt), D Molloy, M McElhinney; D Gallagher, G Ward, B Faherty.